It’s no coincidence that this widespread dismissal of climate change corresponds with the fact that negative consequences of this human-made phenomenon disproportionately affects poor countries. And when you consider the correlation between poverty and race it becomes apparent: climate change is easier to ignore because right now people of colour suffer the most. And their voices are barely even audible in the environmental debate. The latest and most apparent example of this happened nearly over a week ago. 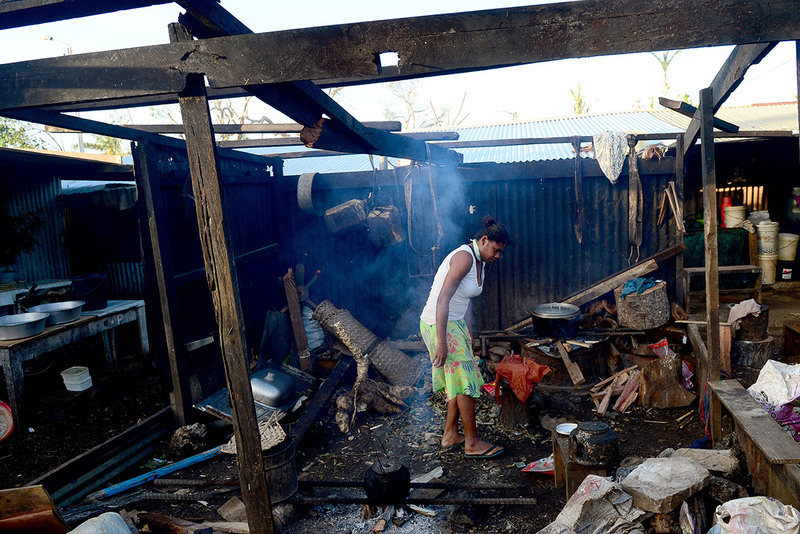 Cyclone Pam devastated huge swathes of Vanuatu, killing 24 people and displacing 3,300. The long-term impacts could be devastating; crops and fishing fleets were destroyed across the archipelago in the south Pacific. Yet, as is so often the case when climate change rears its head, the response from politicians was somewhat muted. In response to the disaster, David Cameron immediately promised the UK would send £2 million in aid to the island nation. That’s all well and good. But he made no mention of climate change, despite all the evidence that this was part of the reason for the severity of the cyclone (incidentally, until Labour leader Ed Miliband mentioned it, climate change was entirely absent from the Budget yesterday. It makes you wonder where the Stern Review’s recommendations are now). This lacklustre response is, in part, related to the fact that currently it’s people of colour who bear the brunt of climate change. Vanuatu is but one of many cases. Resource scarcity looms in Nigeria, Uganda, Ethiopia and the Sudan; rising sea levels could leave Kiribati, Maldives, the Marshall Islands and Tuvalu underwater; while Venezuela, Bangladesh and Pakistan have suffered serious flooding that has already killed thousands. Meanwhile, in Western countries like America it’s people of colour who are affected the most when climate change manifests itself in some form or another (in the UK flooding of the Somerset levels impacted the white population, but as a more-or-less one-off event it’s so far been dismissed as such, though evidence does point to climate change). George Bush’s delayed response when Hurricane Katrina hit New Orleans, a city whose population was roughly 70% black, spoke volumes; Reverend Jesse Jackson said many black people felt this was related to their race. For these people, climate change is not a far-off, woolly concept. It is very much present in their lives. All the while, climate change is pushed to the back of the conversation in the name of profit. The Bill and Melinda Gates Foundation might aim to reduce extreme poverty but they also invest in fossil fuels, which negatively impact the same people they purport to help. This kind of hypocrisy is a reminder that when it comes to people of colour, their lives simply aren’t seen as worthy as their white counterparts. At the same time, people of colour are mostly ignored when the subject is debated, despite their involvement in vibrant grassroots activism. The likes of Naomi Klein do important work in persistently trying to focus the political conversation on the ever-growing threat that environmental changes pose to humanity. However, while climate change deniers are given a platform (in the name of fairness, of course), people of colour — who cope with the evident manifestations of climate change, or who are most likely to in the immediate future — are overlooked. Mohamed Nasheed and Vandana Shiva tend to be in a minority. While pictures of Vanuatuans might briefly attract our gaze at the top of newspaper articles, their words and thoughts on the matter receive little coverage. The climate change debate is far too often neglected, usually in the name of profit. But at the moment it’s far easier to push this issue aside because it’s people of colour, those who are frequently locked out of the debate,whose lives are most likely to be devastated or ended by the human-made havoc wrought on the planet. The People’ Republic of Duriana salute your insightful observations of the disproportionate impacts and injustie of climate change on people of colour. Our diplomacy seeks greater understanding of the roles of race, coloniality and science in producing climate politics today. In this light, and with a strategic view, we are disappointed but unsurprised that the Labour party is victimising immigrants in the run up to your elections next months.